Create your own Van Graphics with our innovative app. Choose from a selection of typefaces, create logos and add symbols. Available as magnetic signs or self-adhesive graphics. 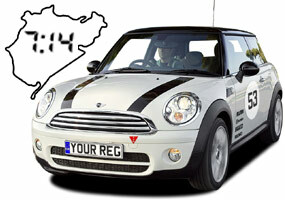 Personalise and Design your own Registration Show Plates, with the most advanced Number Plate App on the internet. Choose your typeface, position and distort characters, add logos or simply upload your own design. Create Door Stacks, produce Viper & Bonnet Stripes to your spec, design your own Number Roundels, personalise Regulation Stickers and customise Nurburgring Decals with your lap time, model & make logo. Restoring a car to its former glory or after a cost effective, short-run of dealer decals? Create your own Supplying Dealer stickers by customising your design from our template. Create your own stickers using our template. Ideal for sticking to vehicles, utilising valubale advertising space. Perfect for business adverts or eye-catching 'For Sale' signs. Browse our range of Make & Model specific decals. 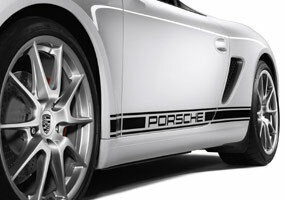 We specialise in Porsche decals and Peugeot decals, aswell as offering a huge variety of decals for other makes & models. Design your own Tshirts, customise Hen & Stag Party Tees or select from our range. Selling your home privately? Create your own eye-catching 'For Sale' board.